Spun yarn pot, Two For One Twister Individual Motor Driven Spindle, Plot TFO, Electric Motors for machine, Electric Motors for textile machine, machine Spindle Speed, textile machine :: Sapru Machines Pvt. Ltd. :: Surat :: Gujarat :: India. Induction motor directly drive individual motor driven spindle, eliminating use of belt/gear for power transmission. Eliminates mechanical loses & attains significant improvement in energy efficiency. Reduces sizable noise level in operating as compared to conventional by belt wear. Spindle can be stopped one by one with a switch, which makes the operation easy. The yarn brakes or runs out, the relevant spindle motor stops automatically: this prevents sequential brakes and yarn waste generation. 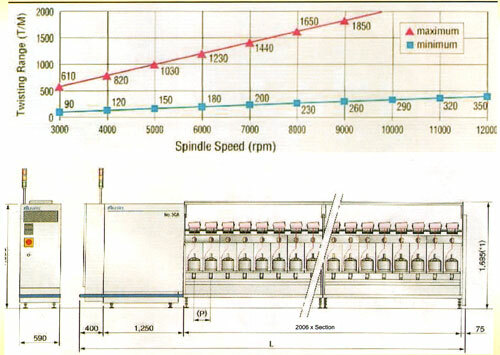 In other words, individual motor driven spindle ensures high yarn quality and stable production. By using the control panel, it is easy to change between s-twist and z-twist, and change the spindle speed and twist count. because such change can be done quickly, the system is ideally suited to production of large numbers of small production lots. All units operate at high efficiency, regardless of the load factor, compared with a conventional drive system.